...To the tender religious holidays of Pasqua in Sicily, residents in the land of sunflowers and olive trees take their festivals very seriously. These festivals in Italy are a sacred time for families to enjoy a celebration of their heritage. Take Calcio Storico is held in Florence. It is not for the faint of heart. This is one of the italian festivals not to be missed. Composed of just under 30 combatants donned in period costume, they parade through the streets before battling each other in a crazy-type football event. The climate in Italy is a dream come true for travelers and retirees alike. Sunlight graces most parts of the country nearly 300 days a year. Winters are usually mild and summers are temperate, making the decision to live in Italy a healthy one. Can you imagine retiring in Italy to the land of breathtaking landscapes and olive groves? Like anywhere, living in the center of Italy's major cities is expensive. Instead, seek out smaller towns where affordable living is just a short train ride away from most metropolitan areas. A European Rail Pass is a great value if you are visiting several spots. Keep in mind that Europe is extremely condensed and easily traveled by train. Know your options before purchasing one. Find out how a European Rail Pass works and how it can best help you. January 6th The Epiphany is a much more celebrated religious holiday than Christmas. End of February to beginning of March Carnevale or Mardi Gras is held all over, from Milan and Venice to Tuscany and into the villages of Sicily. This is one of the most celebrated festivals in Italy. March 8 The Festa della Donna is when men bring flowers to the women they love. March 19 The Feast Day of San Giuseppe is the Italian version of Father's Day. First Week in April Vinitaly is a reknown international wine trade show for professionals and wine lovers alike. A week before Easter Holy Week is a huge religious celebration, especially in Rome where the Pope delivers several masses. Easter Sunday This specific Sunday is a Christian Relgious Holiday with many closures of businesses. Following Easter Mass on Sunday is the Scoppio del Carro fireworks in Florence. This Explosion of the Cart is a procession with fireworks, musicians and flag throwers. Easter Monday This day is just as celebrated as Easter Sunday with closures of businesses as well. April 21st The City Birthday Celebration is one of the most important Italian festivals. Although celebrations take place throughout the country, most events are centered in the capital cities of Turin, Florence and Rome. April 25th St. Mark's Day is the day men present roses to their loved ones. April 25th Liberation Day is a celebration of the day Allied troops liberated Italy during World War II. Be aware that many businesses close during public holidays in Italy. These holidays are an essential part of living in Italy and entusiastically celebrated throughout the regions. Find out the dates of public holidays here to avoid an unwanted surprise. Italy is made up of 20 regions--From the cooler areas of the Po Valley in the north to the sultry Mediterranean spots of the south. Find them all here. Get useful information on getting around in Europe and staying safe. Learn the best method for exchanging currency, withdrawing money, and packing for European travel. The train system in Europe is easy to navigate with a few simple tips. It makes European travel amazingly simple. Remember that many cities have more than one train station such as Paris and London. Find out how to get around and what you can resolve at train ticket station windows. May 1st Labor Day is a day that most of the country shuts down. First Thursday, Friday, and Saturday of May Calendimaggio is a Festival filled with games, songs, events and citizens in period costumes. Festivals in Italy such as Calendimaggio are extremely fun to watch. Mid May The Annual Cricket Festival in Florence provides entertainment, food and music. You will see even crickets being sold in cages. Forty days after Easter Christian feast day known as Ascension is a religious holiday. Throughout June The Annual Flower Display and the Florence Music Festival are celebrated in Florence. June 2nd This is the Anniversary of the Republic in Italy. June 17th Pisa’s Festival of St. Ranieri includes boat races. Sixty days after Easter Corpus Domini is a procession on a carpet of flowers. Mid June through the end of August Verona’s Outdoor Opera is celebrated in the Roman Arena. June 24th St. John the Baptist Day is celebrated mostly in Rome, Florence, Monterosso, and Riomaggiore. Late June to early September Outdoor Cinema Season is celebrated in Florence. July through August This period is known as Opera Season in Verona. Early July The Feast of the Redeemer if one of the most appealing Italian festivals with beautifully decorated boats and fireworks. July 2nd This day reveals the Palio horse race in Siena along with medieval parades. July 15th The Festival of Madonna del Carmine is held in Naples. Follow these cruise packing tips to avoid ruining your vacation. A pre-departure cruise check list is essential. So is scanning important documents and emailing them to yourself before you board. Learn vital strategies when going on that cruise vacation including what you must bring in your carry-on and how to choose your cabin. Use simple strategies for Cheap travel abroad such as staying at hostels or bed and breakfast inns. They are cheaper and very common in Europe and South America. And remember to pocket plenty of extra passport pictures for obtaining visas when crossing borders. Europe is a magical place. But it can get quite expensive. Unless you know all the things to do in Europe for free...from a stunning view of Paris to free concerts in Amsterdam. Backpacking through Europe is an affordable way to discover what this magical continent has to offer. Find out what to pack, how to get around, and what size your backpack should be. It's relatively simple to travel Europe by car nowadays. You can drop off your rental in a different city and even in a different country. Just make sure to ask your European car rental agency about any fees beforehand. On or around August 15th The Feast of the Assumption of Mary is a religious holiday held throughout Italy. End of August International Film Festivalis is celebrated in Venice. First Saturday and Sunday of September The Historical Regatta in Florence includes old time boats and pageantry. September 19 San Gennaro is held twice a year in Naples to celebrate the patron saint of Naples. All through October Musica dei Popoli Festival in Florence includes folk music and dance. November 1st All Saints’ Day is a highly celebrated religious holiday for which there are closures. 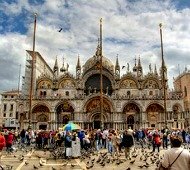 November 21st Feast of Our Lady of Good Health is a Thanksgiving festival held in Venice. December 8th The Feast of the Immaculate Conception is a religious holiday for which there are closures. December 26th St. Stephen’s Day festival is a religious holiday. All through December Christmas Market is held in Rome on Piazza Navona. These are only a few of the many Italian festivals and celebrations. Be sure to check for precise dates if you are planning a trip around a specific festival in Italy. Italian festivals are held throughout the country including regional and local holidays which are specific to cities and regions. It is important to remember that religious holidays may start unexpectedly. This may include crowds and closures in many regions of Italy. Although extremely fun to be a part of, check the dates first before heading out to any festivals in Italy. "A year from now, you'll wish you had started today."